Josh Mefford, R.N., visits with Angel Preciado of Vallejo during his daily rounds. 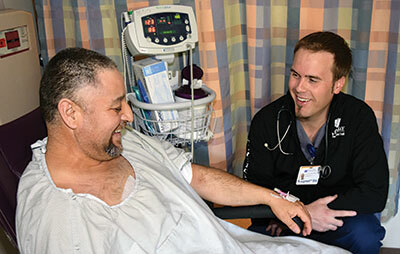 Intensive Care Nurse Josh Mefford, R.N., spends one or two shifts a week visiting nursing units throughout NorthBay Medical Center. His goal is to put another pair of eyes and expertise where it is most needed—with patients who are not in the intensive care unit but who are not flourishing as well as they should following a procedure, illness or injury. He is one of 15 Rapid Response Team “Rounder Nurses” who rotate shifts in the hospital around the clock. Each rounder is a highly trained intensive care registered nurse, who otherwise continues to practice in the ICU. “Hospitalized patients are often seriously ill, which makes them vulnerable to develop other sudden conditions,” Josh explains. And with 120 to 130 patients in the hospital at any one time, he uses his advanced skills to identify the “hot spots”—patients with conditions that could compromise their recovery. He attends nursing department huddles and shift changes where nurses pass patient information from one to the next. He reviews charts and helps nurses identify what extra care a patient may need to make a safe recovery. And he makes rounds throughout the hospital, visiting the nursing floors, labor and delivery and the emergency room. If a Code Blue is called, he’s there to help. “Early identification of problems and immediate intervention can prevent patients from having longer hospital stays or needing a transfer to the intensive care unit,” says Clinical Practice Manager Elisa Jang, R.N., a co-founder of the rounder program. She explains that the nurse rounders work as clinical consultants with the patient’s floor nurse and physician, providing a safety net for both staff and patients. They also serve as mentors to the floor nurses, coaching them through problems and improving their critical thinking skills. For Josh, a second generation nurse, it’s the precision and collaboration of advanced care that challenges him. He joined the Rapid Response Team at the first opportunity and was then hand- selected to participate in the individual nurse rounder trial program. “My dad is a recovery room nurse in Vallejo, and my mom works at NorthBay. I basically grew up visiting the hospital,” Josh says. In 2008, NorthBay established its Rapid Response Team (RRT), comprised of an intensive care registered nurse and a respiratory care practitioner. The teams are available to evaluate a patient’s condition immediately upon request, 24/7. One of the teams’ main goals is to prevent Code Blues, or cardiac arrests. Since inception, the top three reasons the RRT has been called include cardiac-related chest pain/low blood pressure, respiratory compromise and mental status change. The RRT teams proved so successful that by 2012 Clinical Practice Manager Elisa Jang, R.N., and Nursing Director Judy Kornell, R.N., collaboratively began to wonder if patient care could rise to another level, where calling the RRT could be avoided.